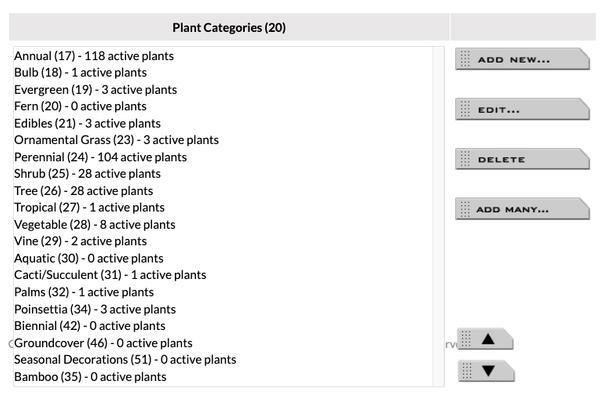 On the GENERAL tab of the Plant Editor, you can assign a plant record to one or more categories. You can provide an optional description and image for each category. Create as many high level plant categories as you need to help organize your plant libary. Organizing your plant records into categories like Annuals, Ferns, Ornamental Grasses, Perennials, Shrubs, Trees, etc. help your website visitors to quickly hone in on the list of plants they want to view and evaluate. You can put each variety in as many categories as needed. For example, you might want to put your Ornamental Grasses in both 'Ornamental Grass' and 'Perennials' (when applicable) and 'Native' (when applicable. If you like, you can also provide descriptions and images for your plant categories.